As the clock ticks down to Taiwan’s presidential and legislative elections on January 16, cross-strait relations appear to be at a crossroads. Democratic Progressive Party (DPP) candidate Tsai Ing-wen is widely expected to win the presidency, but unlike her Kuomintang (KMT) opponent Eric Chu she has not indicated acceptance of Beijing’s bottom line for smooth cross-strait ties, namely the vague principle open to different interpretations that there is only “one China.” Of course, Beijing continues to affirm that Taiwan must eventually unify with the mainland, and has never foresworn the use of force to see its imperative through. Given the Xi Jinping government’s pursuance of nationalistic goals with bold rhetoric and tactics despite serious issues at home, hopes that Beijing will not choose assertive cross-strait policies following a DPP victory may be in vain. In anticipation of possibly acute and protracted Chinese belligerence toward the Republic of China (ROC), a broad assessment of Taiwan’s foundations of national power can help identify areas of strength, weakness, and existential danger to the island democracy. Such an analysis conducted by the authors in a recently published NBR report finds that Taiwan has played a weak hand well in the face of a massive external threat, but its policies have not been optimal due to a lack of cooperation between Taiwan’s two main political parties. On the whole, Taiwan’s foundations of national power are strong, and the island of 23 million continues to punch above its weight in national performance. Taiwan’s GDP measured by purchasing power parity (PPP) is ranked 22nd in the world at $1.075 trillion (2014 estimate), and its GDP per capita (PPP) is $45,900, ranked 33rd (2014 estimate). Taiwan excels at innovation, bolstered by improved intellectual property rights protection, a skilled labor force, and respect for the rule of law. The Ma Ying-jeou administration has promoted research and development and new technologies to ensure that Taiwan maintains its central role in global information and communication technology supply chains, with R&D spending comprising around 3 percent of GDP each year. These factors have helped Taiwan reinforce its status as a major technology power; examples of success include Taiwan Semiconductor Manufacturing Co. taking advantage of the consumer electronics market and becoming the world’s largest contract chipmaker, HTC Corp. becoming a global brand, and Apple Inc. utilizing Taiwan companies as suppliers. Forbes Global 2000, an annual list of the world’s 2,000 largest publicly listed companies, included 47 from Taiwan in 2015, with a strong presence of technology firms. In terms of national defense, Taiwan’s status as an island offers formidable barriers that, if properly exploited, can help keep China’s armies at bay. In order to take the island, an invading force would have to cross the Taiwan Strait, a shallow body of water more than 80 miles across at its narrowest point. The strait is characterized by high winds and seas with complex currents. Furthermore, there are few suitable landing beaches on either side of Taiwan’s coast: the east side has high cliffs and a steep ocean bottom gradient, and the west side has wide areas of mud flats. Fortunately for the ROC, Chinese forces possess no battlefield experience and continue to exhibit weaknesses in training, logistics, joint operations, and human capital. These shortcomings cast doubt on the current capability of the People’s Liberation Army (PLA) to successfully execute a large-scale amphibious assault – widely viewed as one of the most difficult military operations to carry out — across such treacherous natural obstacles. 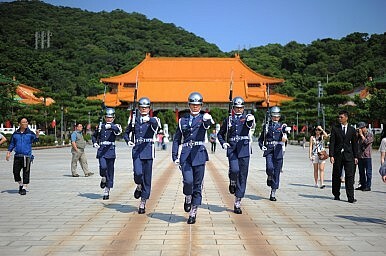 Last but not least, Taiwan’s human resources remain the ROC’s greatest reserve of strength. In addition to being famously friendly (read: soft power), Taiwan’s population is also highly educated: Nearly 70 percent of Taiwan’s 18–22 age cohort were studying in a higher education institution in 2014, making it second only to South Korea. Business acumen is another proven strength. Taiwanese entrepreneurs have arguably capitalized on China’s favorable manufacturing environment better than anyone else, where their firms benefit from cheap labor and land in exchange for strengths such as management and technology know-how. In sum, the ROC has a firmly established base of wealth, talent, and innovative potential for the incoming government to draw upon. These resources will prove instrumental in strengthening Taiwan’s regional posture and addressing internal problems. While these strengths are sources of hope for Taiwan’s future, the island’s power is constrained by many daunting circumstances that are not easily overcome. For starters, Taiwan is reliant on energy resources that come from beyond its shores. Taiwan imports 85 percent of its crude oil from the Persian Gulf and also nearly all the LNG that it consumes, with similar dependencies for coal and other fuels. Key energy trade routes pass through the vulnerable South China Sea, which China seeks to dominate in its entirety. Although nuclear power would offer relative immunity from blockades or other disruptions, its use has been stymied by the halted construction of Taiwan’s fourth nuclear power plant following Japan’s March 2011 nuclear disaster. The result is an island that is safer from nuclear catastrophe but lacking in energy security. Taiwan’s prosperous position in international production chains also has vulnerabilities: it involves large investment in China, over one million Taiwan citizens living and working on the mainland, and over 40 percent of Taiwan’s trade being conducted with the People’s Republic of China (including Hong Kong). This means Taiwan’s economic health depends on its greatest strategic threat. Political influence is a related concern, as Beijing may seek to leverage the island’s taishang (Taiwan’s China-based businesspeople) as a means to influence ROC politics. Moreover, Taiwan is in danger of continued regional isolation. Ma Ying-jeou has sought to lessen Beijing’s objections to Taiwan’s international affairs by steadily advancing cross-strait ties, including through the Economic Cooperation Framework Agreement and the Cross-Strait Services Trade Agreement (CSSTA). However, this policy has provided Beijing a degree of de facto control over the pace and scope of the island’s foreign relations. The so-called Sunflower Movement of mass demonstrations that occupied the legislature in March-April 2014 was prompted by talks on the proposed CSSTA, which was seen by many to promote new levels of cross-strait economic integration that are harmful to Taiwan’s interests. Domestic issues also abound, and Taiwan’s people face challenges that hinder their contributions to ROC power. Although the student-led Sunflower Movement suggests that Taiwan’s student population is informed and engaged in public policy, the demonstrations also pointed to young people’s concern with high levels of unemployment for university graduates, the gap between academic research and industrial R&D needs, and the reality that higher education is not preparing students adequately for work in key industries. Even worse, the island’s human resources will soon dwindle, as low fertility rates and an aging population begin to sap the island’s strength. By 2016 Taiwan’s workforce will begin to shrink by 140,000 workers annually, and by 2021 the population as a whole will start to decrease. Fortunately for Taiwan, the KMT and DPP both agree that immigration should compensate for domestic shortcomings and that Taiwan must attract immigrants that qualify for high-paying positions or may open their own businesses on the island. Notwithstanding all of the above, the greatest threat to Taiwan’s survival comes not from without, but instead lies in the deeply rooted political divide within. Despite the fact that both the KMT and DPP seek to avoid military conflict with China and to sustain the Taiwan government’s sovereignty, partisan wrangling has hobbled a consistent policy to address the island’s precarious position. During President Chen Shui-bian’s tenure, Chen’s ability to gain legislative approval for billions of dollars of offered U.S. arms met protracted opposition from KMT leaders controlling the legislature. Similarly, during Ma Ying-jeou’s presidency, Ma’s de-emphasis of military preparedness in favor of effective accommodation of China to ensure Taiwan’s security has encountered strong disapproval from the DPP, which instead favored greater defensive preparations to bolster the island against the growing Chinese threat. Such gridlock along party lines on sensitive issues of national defense are emblematic of a larger weakness in Taiwan’s infrastructure capacity — specifically the ability of the governing authority to set goals supported by elites and consolidate enough power to see those goals through. Because intense political competition has been viewed in zero-sum terms, neither the DPP government of Chen nor the KMT government of Ma has been effective in reaching consensus about what should be done to strengthen Taiwan, and each side continues to seek political advantage by focusing on the perceived shortcomings of the other’s policy proposals. Should a DPP government that is unwilling to accommodate and reassure Beijing come to power, it is not at all clear that a united ROC response would be mustered to deal with increased dangers from across the strait. Taiwan can ill afford to muddle through another four years, with bold policymaking addressing Taiwan’s demographic trends, international position, and national defense being sabotaged by fractious partisan debate. Yet not all is gloom and doom for the island. A united ROC that can find innovative solutions to its problems is a realistic future both parties can pursue to improve Taiwan’s strong but stifled national power. And while Taiwan cannot stand up against China alone, Taiwan is not alone. U.S. support for the ROC will continue and possibly expand, as voices calling for Taiwan’s integration into Washington’s larger “rebalance” strategy versus an expansionist China become more and more prominent. David Gitter is a Research Consultant with Defense Group Inc. (DGI), where he provides research and analysis for DGI initiatives pertaining to China. Robert Sutter is Professor of Practice of International Affairs at George Washington University. The Liaoning passage’s ‘defiance’ is exaggerated; transits should be seen as more normal.